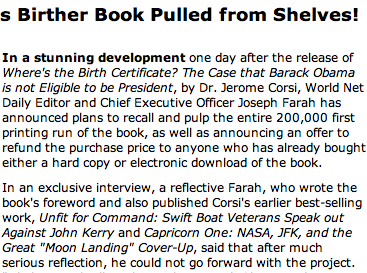 Birther book still exists, selling "very well"
Despite a parody blog post that the book "Where's the Birth Certificate? The Case that Barack Obama is not Eligible to be President" had been pulled from the shelves, the book is, in fact, still available and apparently doing quite well. WorldNetDaily CEO Joseph Farah, who is publishing the book, tells me that "not a word" of the Esquire item is true. He said it is, in fact, selling "very well. This is an attempt to change that." Despite being released just days after Obama put out his long-form birth certificate, Coris's book is currently #94 on Amazon's bestseller list and #1 in the nonfiction government section. Though that's down significantly from the pre-release ranking of #1 overall at Amazon -- before Obama's birth certificate was released.